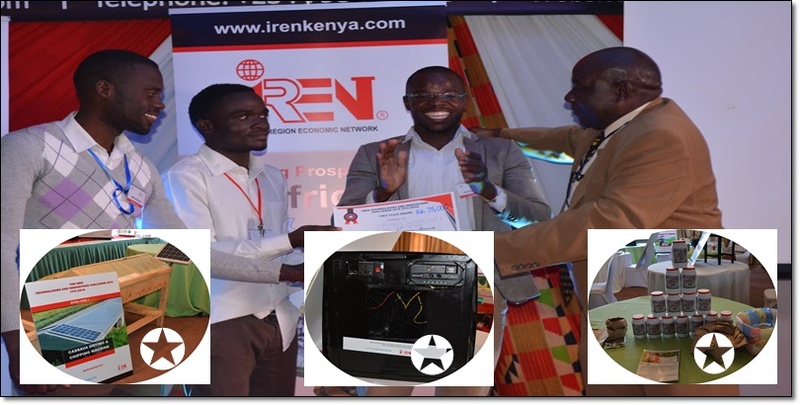 The “NGAO” solution that dehydrates cereals to prevent aflatoxins, a self-sustaining energy system that can power machine and a solar powered chipping and drying equipment emerged top in the just concluded IREN Technologies and Innovations Challenge 2018 (ITIC-2018) for the Lake Region that took place on 29th November, 2018. ITIC-2018 covered 28 solution hubs from the 14 counties that make up the Lake Region Economic Bloc. Through competitive process 14 hubs were selected to showcase their solutions at the ITIC-2018 Expo that featured training, networking and pitching sessions. Trans Nzoia County Solution Hub emerged top with the post-harvest management solution dubbed “NGAO”, a pesticide that uses dehydrating properties of diatomaceous earth to dehydrate cereals to prevent aflatoxins and deter weevils. Kakamega County Solution Hub developed self-sustaining energy system that powers an irrigation water pump. Busia County Solution Hub came up with a solar powered cassava drying and chipping machine as a solution for post-harvest losses. The ITIC -2018 competition aims to promote smart solutions for the 14 lake region counties by identifying scalable food security compatible technologies for use by farmers and Micro, Small and Medium Enterprises (MSMEs) across the agribusiness value chains. “The Friedrich Naumann Foundation is proud to be associated with the innovative activities exhibited by young people from the Lake region of Kenya,” said Veni Swai, Senior Programme Officer, East Africa. “The key objective of ITIC-2018 is to grow a constituency of young people who take initiative and proactive steps to address challenges that face the lake region. I welcome more partners to this initiative to enable us compliment county government activities in the region,” said James Shikwati, Chief Executive Officer, IREN. Organized by the Inter Region Economic Network (IREN) in conjunction with The Friedrich Naumann Foundation, the ITIC-2018 recruited 166 youth who were enrolled into County solution hubs. The County Solution Hubs underwent a 6-month mentorship program to identify the challenges in their counties; conceptualize viable solutions, work as a team to actualize the solutions and develop prototypes. They also underwent an accelerator training on pitching. The second edition, ITIC-2019, will be unveiled early next year. The Friedrich Naumann Foundation for Freedom is the foundation for liberal politics in the Federal Republic of Germany. It aims to promote the goal of making the principle of freedom valid for the dignity of all people and in all areas of society. The support of human rights, rule of law and democracy in more than 60 countries form the core of the work of the regional offices in Europe, Africa, Asia, and Central America. International and transatlantic dialogue programs are used to promote these three values. In East Africa, the foundation supports development of think tanks that network liberal thinkers, come up with shared concepts for development and progress by working with liberal partner organizations in the political realm as well as civil society. The Foundation is also working on a project to promote secure property rights with the aim of improving food security in the country.